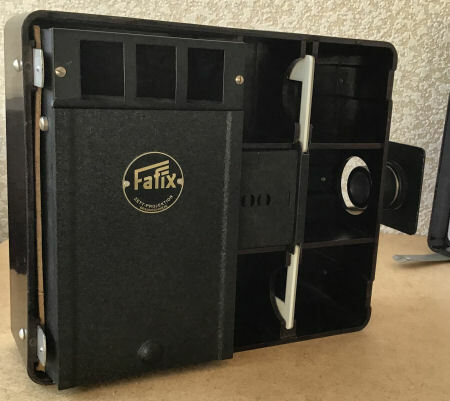 The Fafix slide projector is a very simple projector that at first glance looks like a lunch box with a lens built into one of the sides. The lid must be removed to use the projector. We then see the lamp house, some compartments for storing slides, a slide transport system and the projection lens, which must be extended. The transport system comprises two slots; the new slides are pushed into the top one, the slides already shown can be taken from the bottom slot. The slide being projected is located between these two slides. The inside of the lid is equipped with a white cardboard that serves as a projection screen. 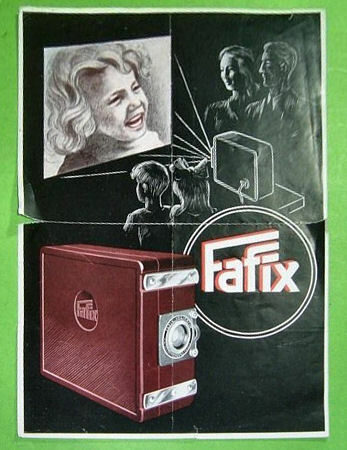 The Fafix is made of bakelite. 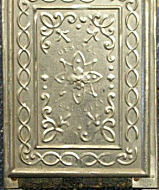 The dimensions are approximately 19 x 8 x 16.5 cm. 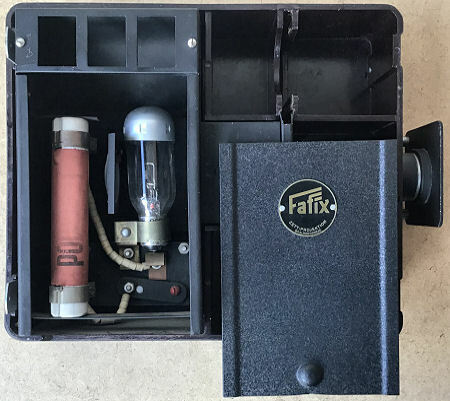 This projector was later succeeded by the Fafix II, a somewhat more luxurious version with a 'normal' slide transport, among other things. 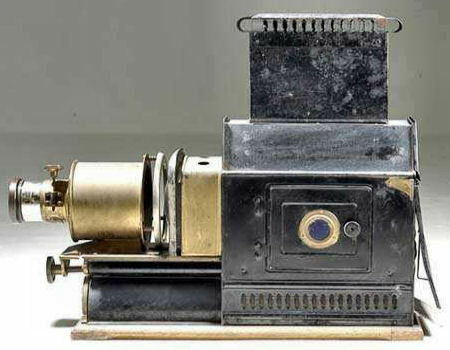 The device was manufactured by Zett-Projektion Braunschweig, a photo-technical company that was founded by Erich Zillmer. 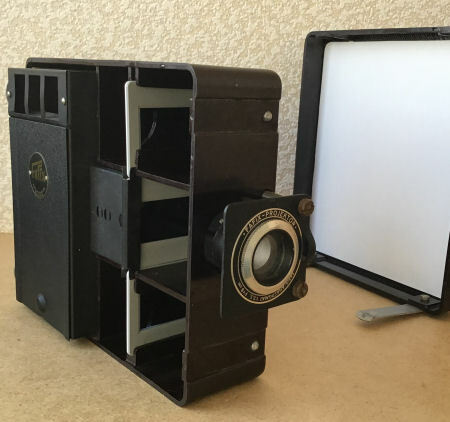 From 1957 the entire production was continued by Voigtländer. 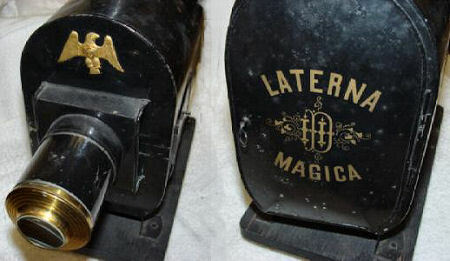 Black painted tin magic lantern, marked on the back door in golden letters 'Laterna Magica' round the combined initials 'HD', that stands for the manufacturer's name Hoffmann, Dresden. The original box is marked on the sliding top 'No. 202a' and again the initials 'H.D.'. 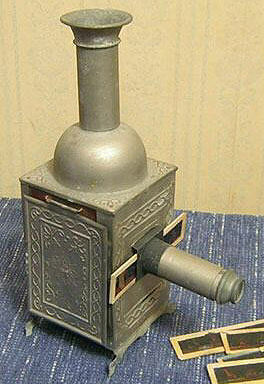 A small door at one sides gives access to the controls of the oil lamp inside. Hoffmann's trade mark, the golden eagle, is on the front. The lantern stands 16" (41 cm) tall. C. 1850. 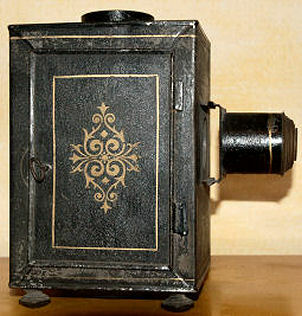 Magic Lantern Tachyscop C20 N31181. 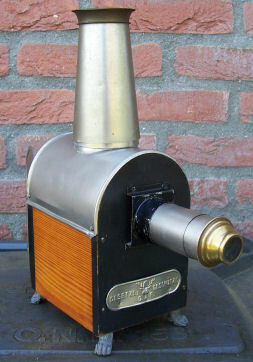 This Magic Lantern was made in Düsseldorf, Germany, by Ed. Liesegang. The still extisting firm of Ed. Liesegang was founded in Elberfeld (today Wuppertal) in 1854. Window cover with spread winged U.S. shield breasted eagle with ribbon banner in beak reading 'Ex Pluribus Unum' and surrounding inscription 'Jung Amerika Gestezl. Geschutzt'. 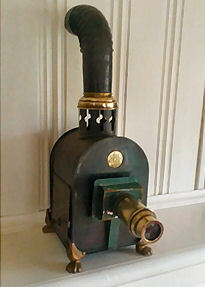 This rare antique magic lantern dates circa 1890 and is partially made of wood. 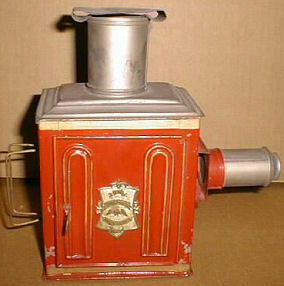 Roof, lens and chimney are made of tin. The metal legs are beautiful decorated. 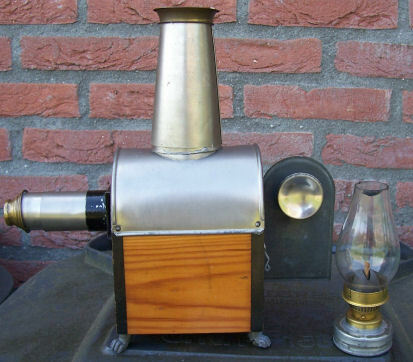 The lantern was made by a German manufacturer, probably by Max Dannhorn of Nuremberg, and was special made for the American market. 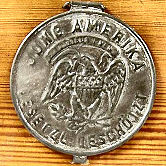 The round metal lamp window cover reads: JUNG AMERIKA / GESETZLICH GESCHÜTZT, around the picture of an eagle, and may be lifted to allow adjustment of the lamp flame. 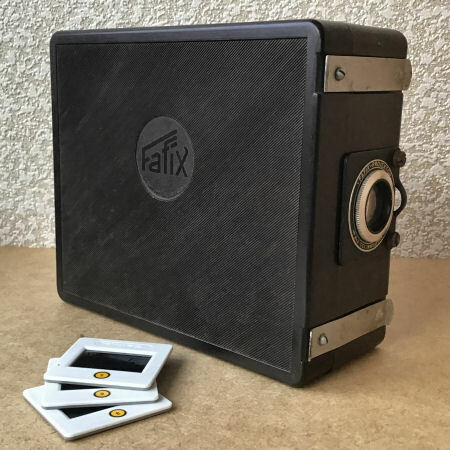 The overall dimensions are 4 x 5 x 11" (10 x 12 x 28 cm) and the original box in which the lantern is stored is 4" x 9" x 13" (10 x 23 x 33 cm). The front lens is extendable to about 6 inches (15 cm). 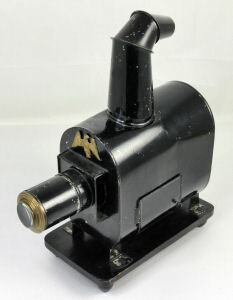 This magic lantern bears a close resemblance to the Jung Amerika lantern above. There are however some important differences. The most striking features of the D.F. 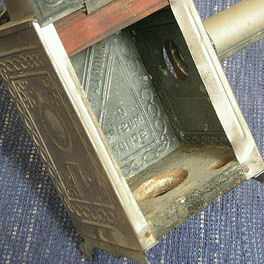 lantern are the simple claw feet and the missing window cover at one of the sides. Trade mark: the head of a deer carrying some concentric circles between its antlers, flanked by the initials D.F. 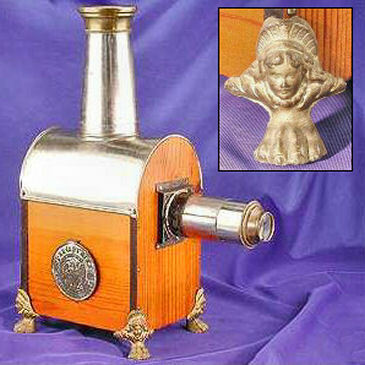 Another "Jung Amerika' magic Lantern, 8 1/2" (21.5 cm) tall. 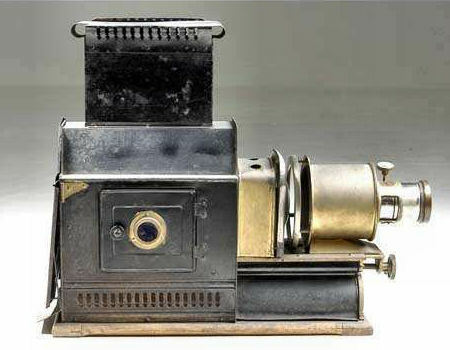 German ZEISS IKON Magic Lantern projector from c. 1928. 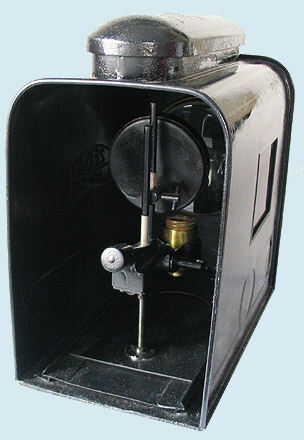 The large metal body holds the condenser lens unit, that consists of two large convex glasses held together by two brass sleeves, the front lens tube has an adjusting lever for the diaphragm aperture and a lever for the rack & pinion to adjust the forward and backward movement of the barrel. The lantern measures 6 x 12 x 18 inches approximately. 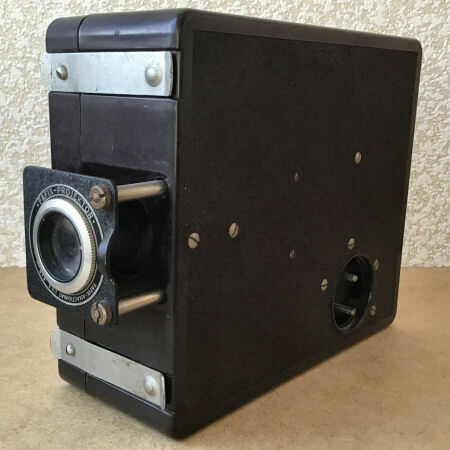 The “ZEISS IKON” trade mark is embossed on the outer body. Probably German. This magnificent lantern is probably from the early or mid 1800s. 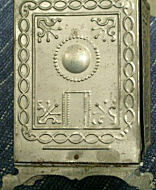 It's made of exuberant decorated tin, fixed with nails on the wooden parts inside; there are no screws or welds. 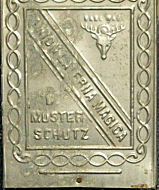 On one side is written in capitals: "UNION LATERNA MAGICA - MUSTER SCHUTZ". This side shows also the head of an elk, probably a trade mark, On the hinged door there are some other writings, but they are difficult to read, anything like a patent number. 'Musterschutz' means patent. 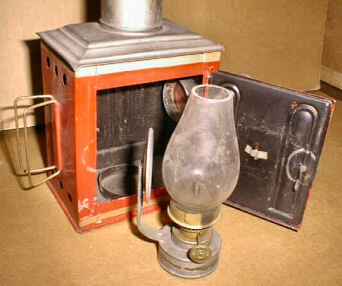 The lantern measures 28 cm in height including the chimney, 9 cm wide and 18 cm long including the lens. 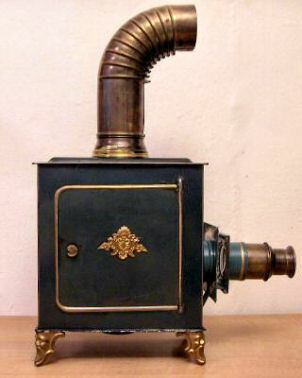 German magic lantern. On the back the name 'W. 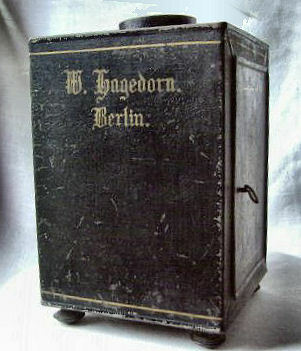 Hagedorn. Berlin.'. 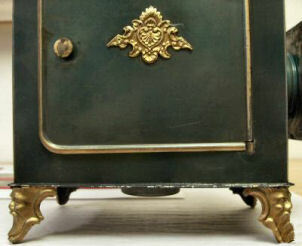 The lantern is black painted and beautiful ornamented with a golden rim and floral motives on both sides. 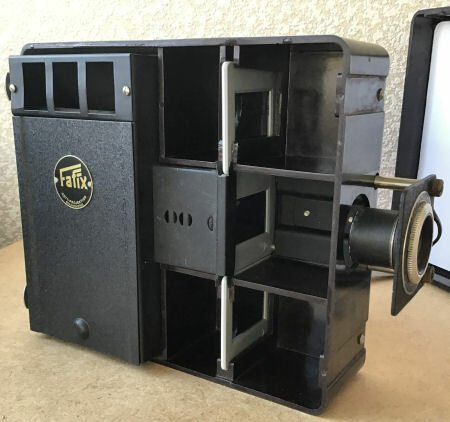 Size: 24.5 cm h, 14.5 cm w, 15.5 cm d.
Children’s toy magic lantern in its original cardboard box, with twelve glass magic lantern slides in slotted partitions. 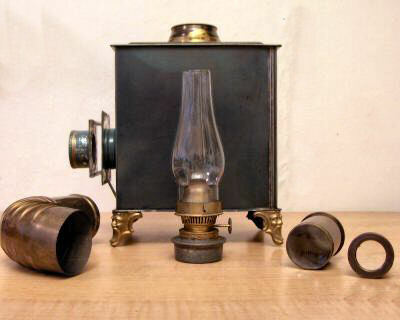 The box measures 12.5 x 9.5 x 5.25 inches (32 x 24 x 13.5 cm) and the lantern itself measures 9.5 x 7 x 4.5 inches (24 x 18 11.5 cm), excluding the lens mounting and removable chimney. 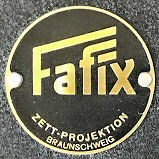 A coloured paper label pasted on the top of the box has an oval emblem with a bird, wings outstretched, on a shield with the initials "F N", and the phrase "Made in Bavaria". 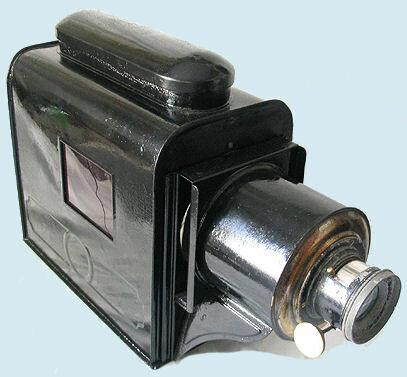 It shows a boy using the magic lantern. A pink paper instruction label is pasted on the inside front cover, with text in English and German. 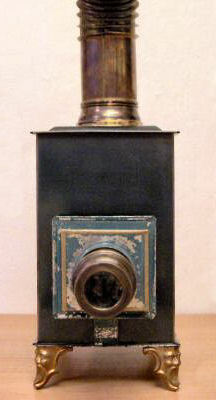 The green tin lantern house has a raised gold toned medallion on the hinged side door and gold toned decorative feet in the form of theatre masks or grotesque’s heads, and gold trim around the lens mounting. 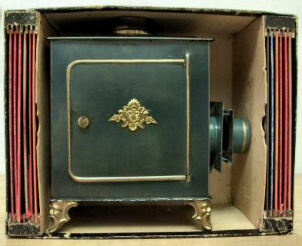 Tin magic lantern with four gold pained claw feet, two latching doors, one on the side and one in the rear for placing the burner. 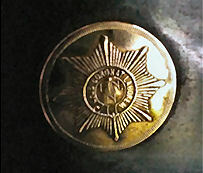 A star-symbol on front of the lantern reads: "Opus Coronat Laborem" with letters "FNN" in the centre. Latin is not my strongest language, but I guess that it means something like: 'The piece of work crowns the labour'. 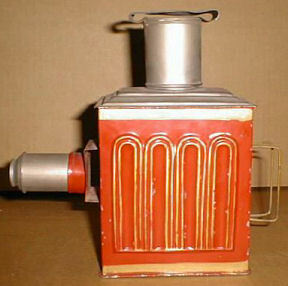 The chimney piece is detachable. 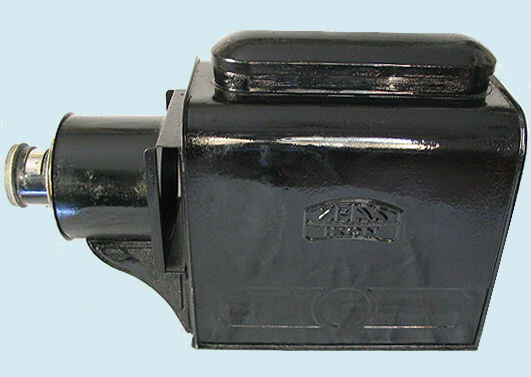 Approximate dimensions are 14 x 5 x 6.5 inches (36 x 12.5 x 16.5 cm).